Writer and violinist Mary Flanagan grew up in Springfield, the oldest child of the David and Kathleen Goedtke family. Most people know the Goedtkes because of their music, but Mary’s passion has always been shared between writing and her violin, both of which she continues to use today in her work. Attending Minnesota State University in Mankato, Mary majored in music and minored in creative writing, graduating in 2015. During school she helped pay her way through school by teaching violin at the Mankato Suzuki School. Now she is the Executive Director and has 35 students heading into this fall. 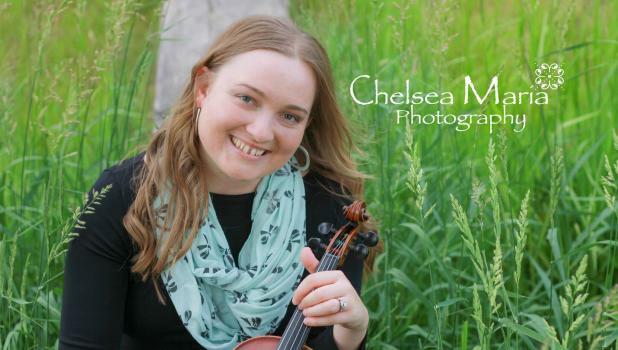 A 40-year-old program, the Mankato Suzuki School has a proud history, the starting place of world-class violinists Becky Buhler, Grammy nominated bluegrass artist and Peter McGuire, first chair second violin of the Minnesota Orchestra in Minneapolis. As Executive Director, Mary is focused on bringing recognition to the school and bringing certain aspects of the school into the 21st century with a new website, online registration and promoting their 40th year anniversary locally, trying to make more people aware of the excellent instruction provided there. “It’s a full time job with never a dull moment,” she said. Mary started her job as Executive Director in January of 2018, and realized that she would need a break every now and then from the stress of stepping into her new role. At around the same time, she realized how much she missed the writing she had done in college. And so, she began looking for ways to supplement her teaching income by writing for various publications. “I figured I needed a different outlet that wasn’t stressful but could also help pay off the college loans,” she said. On Facebook she saw an ad for contena.co, a website that specializes in helping writers find the best writing jobs across the country. Within two months of searching, Mary found a new blog that was hiring. The gig looked perfect. “It was called ‘Our Life Logs’ and they were searching for freelance writers who could interview people and tell their life stories. It is basically a website of feel-good stories. The stories written are of normal, everyday people who have struggled and on their journey of life chosen to learn from the difficulties they have encountered,” said Mary. In high school Mary worked for the Advance Press in Springfield helping Doris with local stories. “That work wasn’t a whole lot different from what Our Life Logs would require of me,” said Mary. Excited, she emailed Doris for help with her application and Doris was happy to oblige. Mary was hired soon after. The whole experience so far has been a dream come true. The job fits like a glove. “My parents always knew that I was an extrovert. I developed my own language before learning to talk and would go up to complete strangers and chatter with inflections and all the rest. I guess that hasn’t stopped because now I am interviewing people from all walks of life and telling their life stories in my own writing style! Basically, the same thing,” laughs Mary. As a child, it all started with writing puppet shows and plays. At age 9 and 10 she wrote plays that she performed at family reunions. “My 45 cousins were my actors and actresses. There were plenty to choose from for each role I created. Normally they were willing to be part of it. If they weren’t I put them to work helping with props and scene changes,” she chuckled. She credits her interest in writing to her parents who home-schooled her using a classical curriculum of books. From a young age she was always reading L.M. Montgomery, C.S. Lewis. J.R. Tolkien and other classical authors. That got her love of learning going, but it wasn’t until college and her creative writing classes that she really fell in love with and discovered non-fiction. “My professors were always having me write poetry from my every day experiences and journal moments from my violin teaching and everyday encounters. I hadn’t realized how interesting everyday life could be,” she observed. In the month of September, Our Life Logs is trying to promote their Facebook page of stories and along the way they are giving promotions to the freelance writers with the most “likes” on their stories, shared on Facebook. Mary’s first two publications, “I Consider Myself Lucky” and “God had the last say in my life” are featured on the Facebook page and can be viewed there! Mary asks her devoted Springfield readers from her High School days at the Advance-Press to follow her work by “liking” the Our Life Logs Facebook page. When you visit the site, scroll down to find Mary’s articles and “like” them so that she can be in line for her promotion! If you know of someone who would be willing to share their life story, or if you are that person, you can reach Mary at her writing email: maryaculous@yahoo.com or call her (507)-276-8747. Mary never turns down any story. See complete story in this week's issue of the Springfield Advance-Press.